Our mission is to help you or your loved one enjoy independence, not fear it. We offer the kind of in home care that makes it possible to thrive at any age. How Can We Help You With Your Home Care? It may have started slowly… Mom couldn’t find her keys or got lost driving. Maybe she left the stove on or fell getting out of her chair. But, you now realize that she needs help with those activities that she has always done, otherwise, she may no longer be safe on her own. You need to get the best care to help with those daily activities. That’s where Cherished Companions Home Care comes in with a range of senior care services so your loved one can remain at home having the control and ability to thrive independently. When a spouse or friend struggles with physical or memory issues that impacts their ability to do day to day activities the burden falls on those closest to them. As their advocate, you are absolutely committed to making sure that your loved one gets the best care possible but often don’t know what resources are available or where to turn. All that you know is that you made a promise to take care of them. The stress on you as a caregiver can feel unbearable at times. At Cherished Companions Home Care we are committed to helping you figure how to best care for your loved one. We work closely with you, using our years of expertise, to develop a plan that is customized to your individual situation to help you keep those promises. Our Caregivers are the best available… period. That is our commitment. It takes a special person to be a Cherished Companions Home Care Caregiver. We look for those people that see this as a calling and not just a job. We only want those that truly desire to make a difference with other people and who recognize what a unique privilege it is to share in the lives of our clients. Our Caregivers are chosen because they recognize that privilege and they see this as a profession that requires great skill and emotional intelligence. They want a company that recognizes and celebrates their profession. Everyone in our office is a caregiver and has experienced what it is like to give care. We have also all been touched by the experiences involved with having a loved one who has needed care. We are a mission-based company that has care at the very heart of everything we do. At Cherished Companions Home Care we have high expectations for our employees but our caregivers would have it no other way. We want those that see this as a destination... a place to thrive with others that love people and caregiving. We are a hard company in which to get hired but a place few ever want to leave. As a professional, people rely on you to help them make informed choices. They need help and often need that help immediately. You feel the confusion and anxiety that they are experiencing and want to assist them in get the help they need to relieve their fears. It’s important that they don’t transition home only to end up right back in the hospital. At Cherished Companions Home Care we will work closely with you to ease that transition safely back to a home setting. We are a mission based company that provide care because we do care. We are available 24 hours a day and will quickly meet with and assess your client. We custom design a care plan and match the patient with the ideal caregiver that has the skills, training and right temperament for that individual. When you refer to Cherished Companions you have the peace of mind that you have placed your patient in caring hands. Feel safe with our care. Join our happy clients. See an overview of our services. And we love to share what we know. Browse all our resources. We know that your loved one’s heart is at home. Remaining independent may have become a little challenging, and that’s where home care can help. In this guide, we are going to share with you the complete ins and outs of home care. 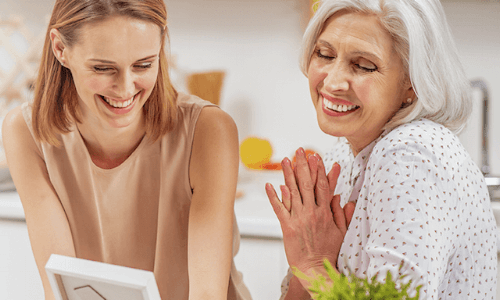 Choosing a home care agency for your aging parent or family member is one of the most important decisions you can make for his or her long term health, happiness, and safety. That is why we have developed this infographic as a tool for you to reference during this important time. The Cherished Companions Institute has been involved with studies on dementia to help develop tools to aid with the difficulties of Alzheimers.